Cloud Foundry is one of the leading cloud PaaS solutions out there today, allowing users to easily develop and deploy applications by doing all the worrying about the underlying infrastructure of your applications for you. Nothing in life it totally care-free, and if you’re running apps on Cloud Foundry you still need to take care of troubleshooting and monitoring them. This requires extra planning, configuration and implementation. Cloud Foundry’s Loggregator component captures logs from the various components and applications running on the platform, aggregates these logs, and gives users full access to the data either via CLI or the management console. 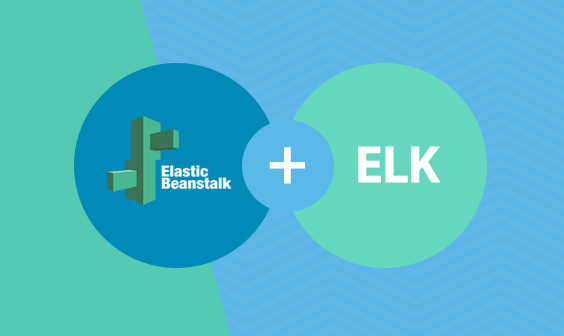 Cloud Foundry can also be configured to export the log data to an external logging solution, and in this article, we will look into exporting this data into the ELK Stack (Elasticsearch, Logstash, Kibana). Cloud Foundry – you will need a Pivotal account to be able to deploy your Cloud Foundry application. ELK – you will need either your own ELK deployment or a Logz.io account. The steps below describe shipping logs to both, so take your pick. The first step is to deploy a sample Spring application. 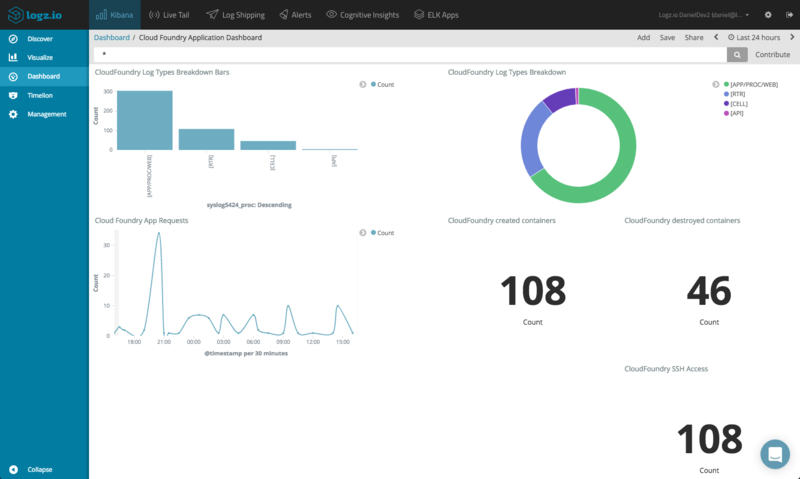 Cloud Foundry aggregates application logs and gives you access to them either in the Pivotal management console or within CLI. These logs include HTTP access logs, as well as output from app operations such as scaling, restarting, and re-staging. 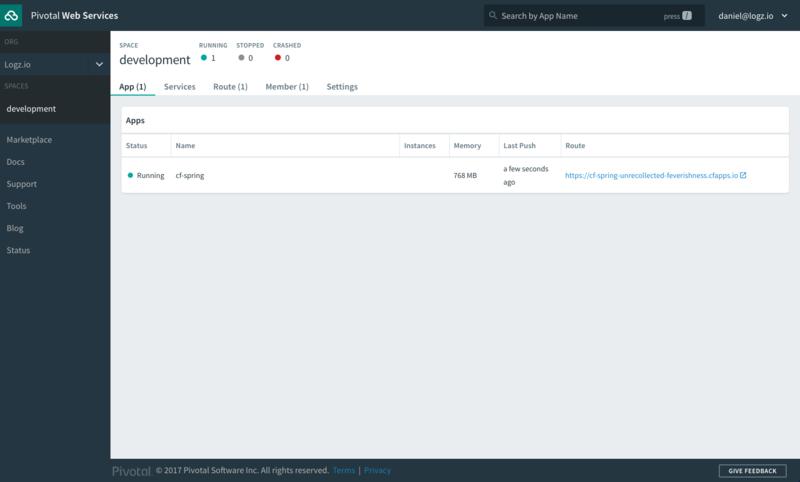 On the premise that you already have an ELK Stack running, shipping Cloud Foundry logs to ELK consists of two main steps: configuring Logstash and creating/binding a log draining service. To make sure your logs are parsed correctly, you need to configure the Logstash configuration file. Save the file and start Logstash. The next step is to create a Cloud Foundry logging service that will drain the logs to syslog and then bind this service to our application. If all works as expected, you will be able to define the logstash-* index pattern in Kibana and subsequently begin seeing logs within a minute or two. Shipping to the Logz.io ELK Stack does not differ all too much than the procedure described above except that parsing is handled by Logz.io automatically so all that is needed is to configure and bind a logging service. IMPORTANT! 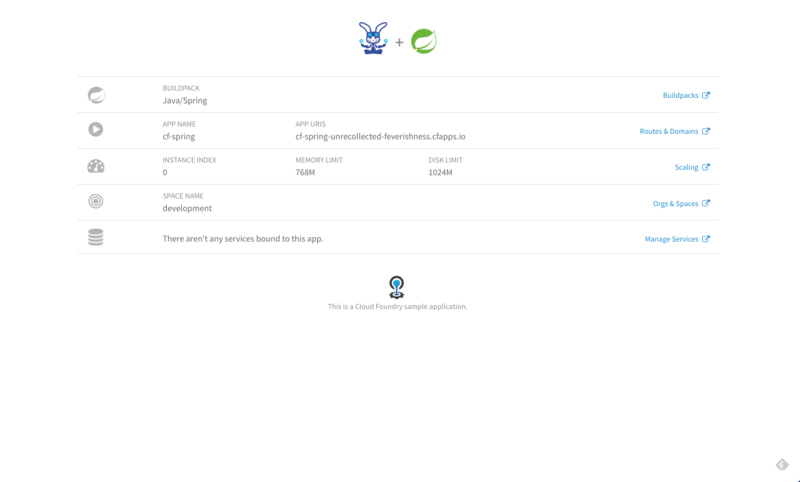 Logz.io automatic parsing for Cloud Foundry logs is not complete and is still being developed. The logs may not appear as expected. After a short delay, logs begin to flow automatically. Be sure to refresh mapping from the Setting page. Slicing and dicing data in Kibana is an art unto itself. Depending on what application you have deployed on Cloud Foundry and how you’ve set up logging from within your code will ultimately change the way analysis is performed. Here are some basic examples of what can be done with Kibana with the Cloud Foundry logs (screenshots are from the Logz.io version of Kibana). Cloud Foundry attaches a log type to each log message depending on its origin. For example, HTTP requests going through the router will get the RTR log type. 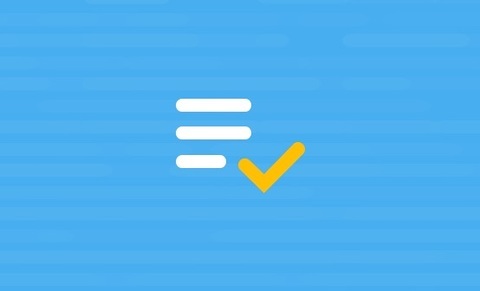 Application logs will be assigned the APP log type. You can read more about these types here. A basic pie chart visualization using the syslog5424_proc field will give you a nice breakdown of the different logs. As mentioned above, the Cloud Foundry router generates RTR logs when it routes HTTP requests to the app. Using a line chart visualization, you can identify spikes in traffic. You will need to use the Discover tab to drill down into RTR logs, and then create the visualization based on the saved search. Use a count aggregation as the Y Axis and a Date Histogram for the X Axis. 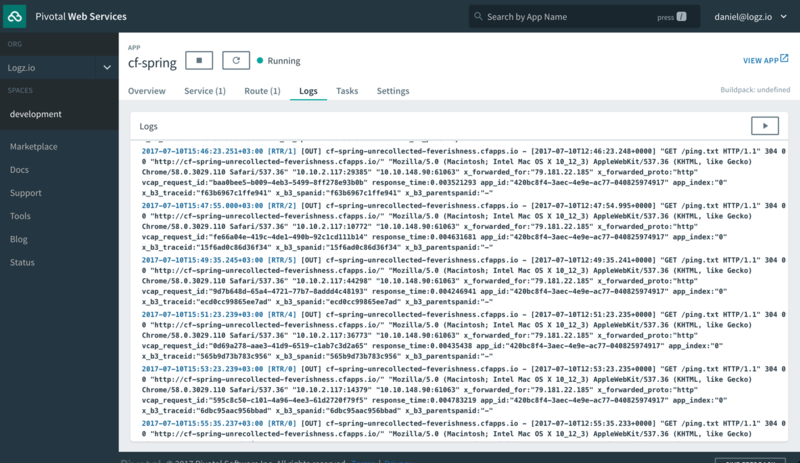 Cloud Foundry’s container management system is called Diego, and it generates what is called CELL logs each time an application is started or stopped by you. Diego also generates log messages when an app crashes. 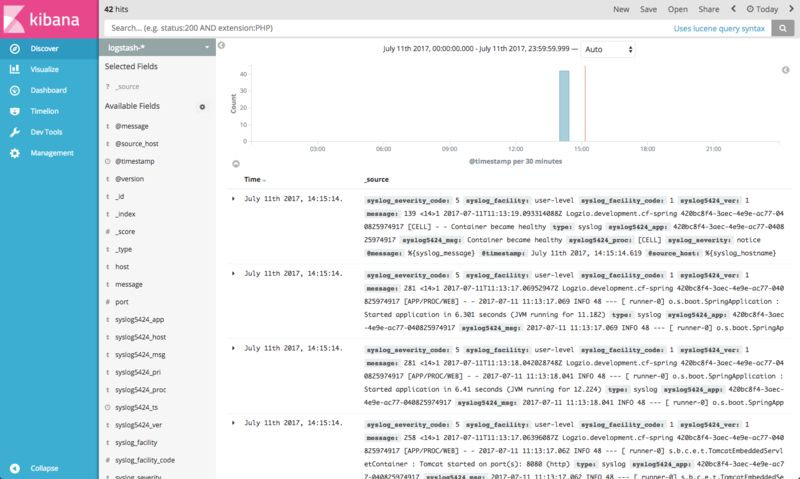 You can monitor these occurrences in a number of ways using Kibana visualizations. A basic metric visualization can indicate for example, how many times containers were started and stopped. 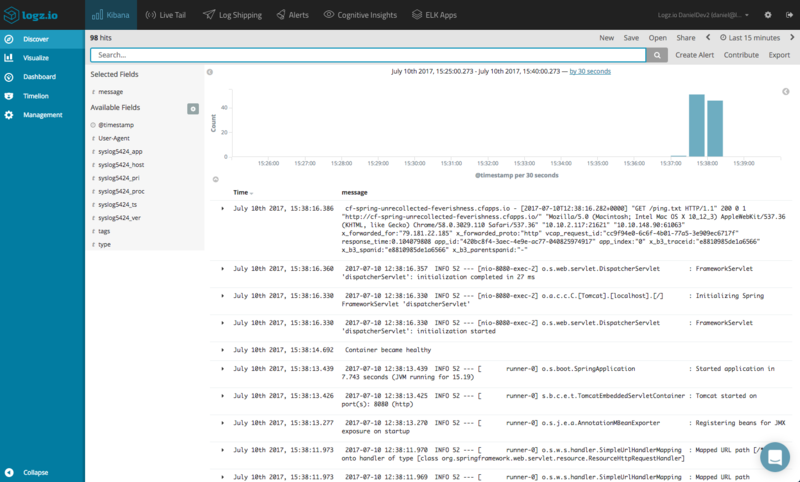 Drill down into these specific logs in the Discover tab in Kibana and save the search. 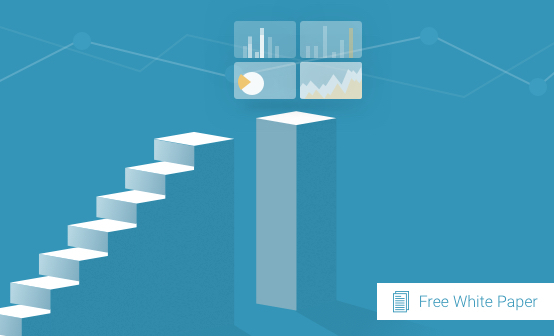 Based on this search, create a simple metric visualization using the count aggregation. Again, how you visualize your Cloud Foundry application depends on your specific application. 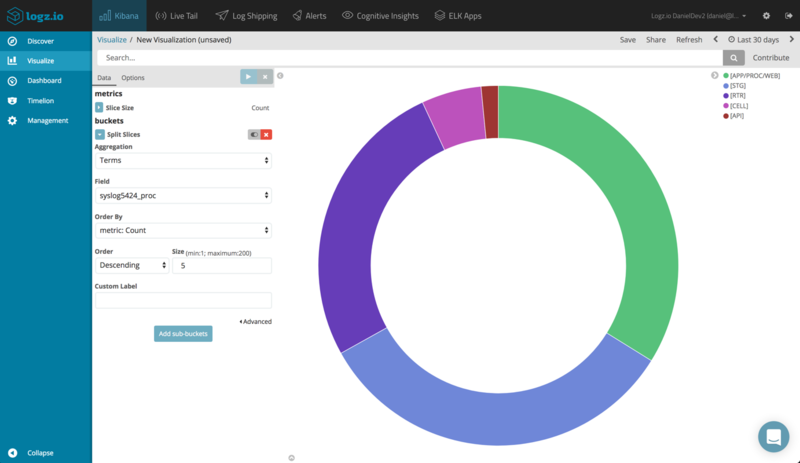 The visualizations above are just a basic example showing the capabilities of adding ELK as a centralized logging layer on top of Cloud Foundry. 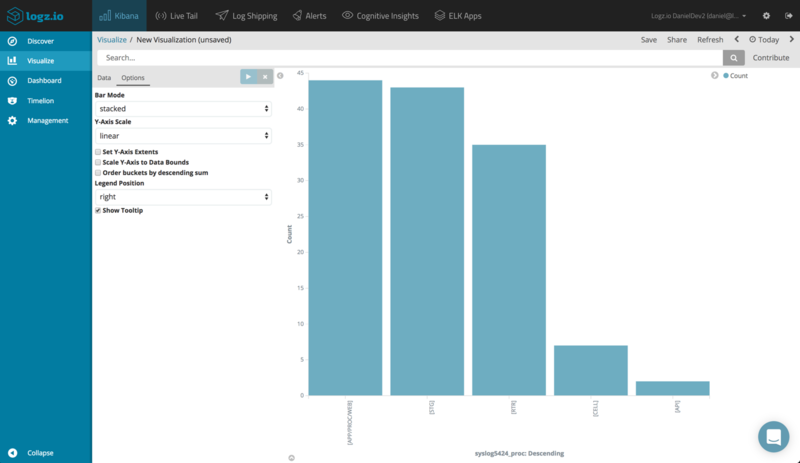 For development and small-sized applications, using the supplied logging services in Cloud Foundry might suffice despite the fact that deeper analysis and visualization are not part of the package. For larger environments though, you need to think in terms of a centralized logging solution. 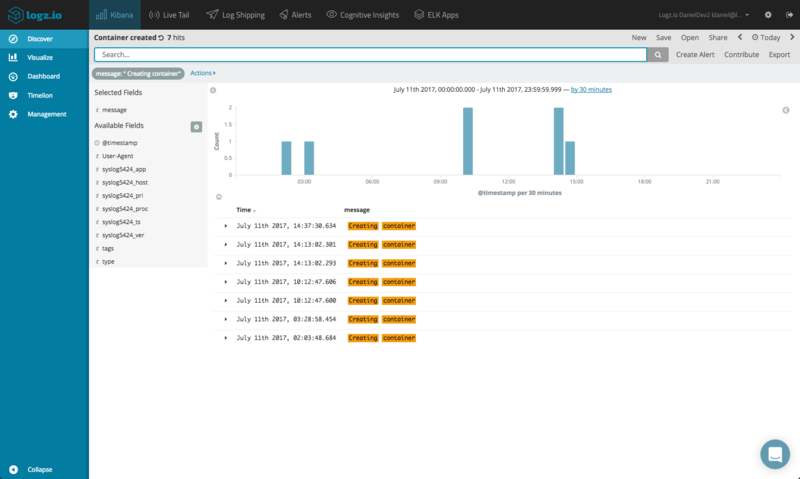 Using ELK, you will be able to easily store all the logs being generated and aggregated by Cloud Foundry and create a monitoring dashboard for your application. The only tricky part is the parsing step, which may require some fine-tuning in Logstash.